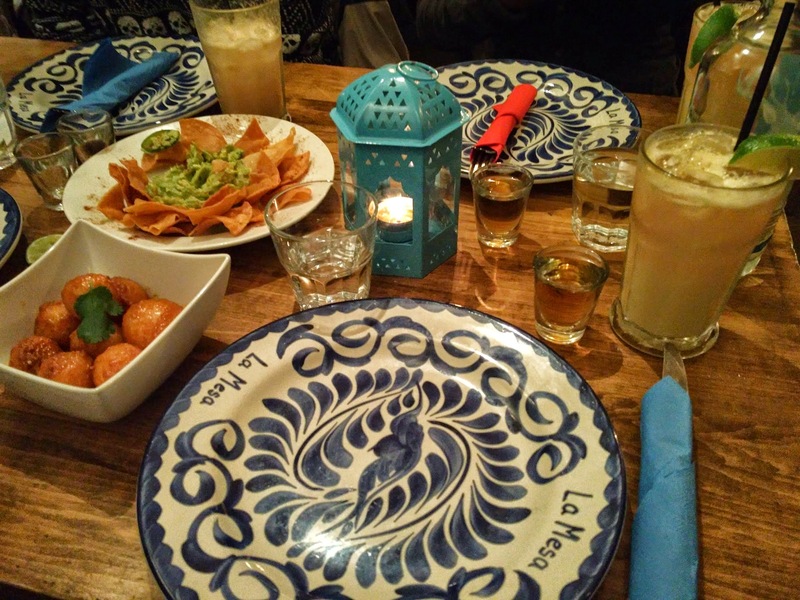 Fonda Lola’s #MexicanFiesta continues to warm up diners through the Fall on Queen Street West with entrants from their Fall Menu. It is a promise that these items will warm you from the inside out with authentic and delicately spiced dishes, as, once the colder season hits: there’s nothing you would want more. The entrance is decked out in bedazzled and decorated skeletons in celebration of the approaching Day of the Dead. 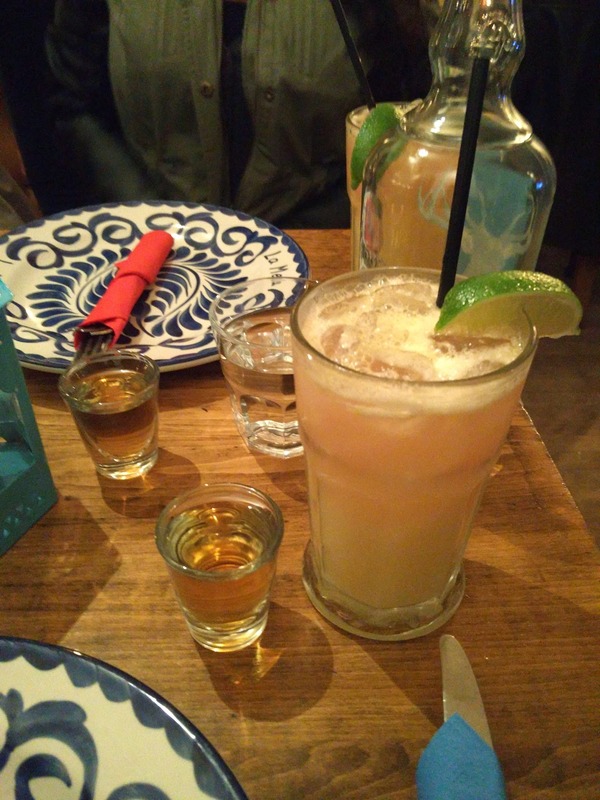 Upon seating among the rows of wooden seats and tables, surrounded by walls traditional patterns and imagery, we were greeted with a cheers of a Tequila shot, crunches of freshly made Guacamole with house-made tortilla chips and a fragrant Rose Kombucha Margarita. 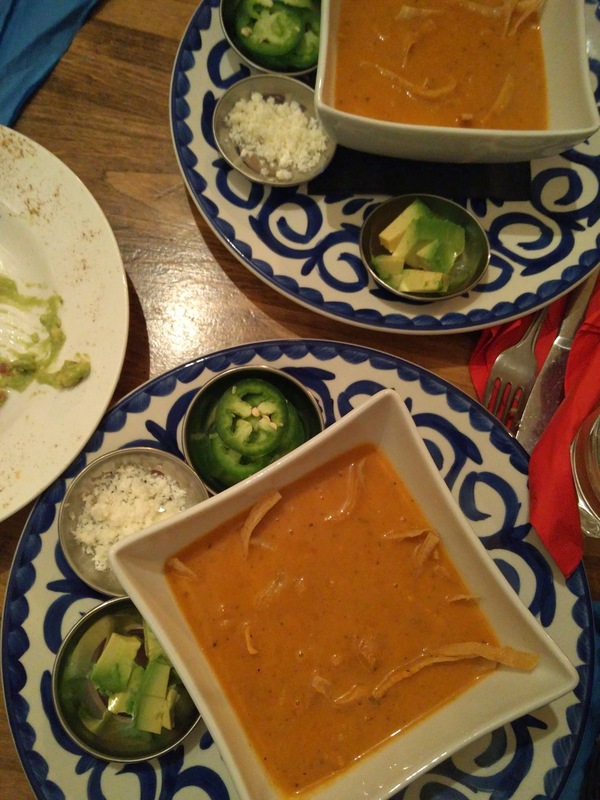 The next two dishes to come are baby potatoes, cooked confit-style in a chipotle sauce and a warming vegetable soup, poured over crisp strings of tortilla chips with avocado for buttery-ness, panela for a sharper texture and jalapeño for an fresh spice. 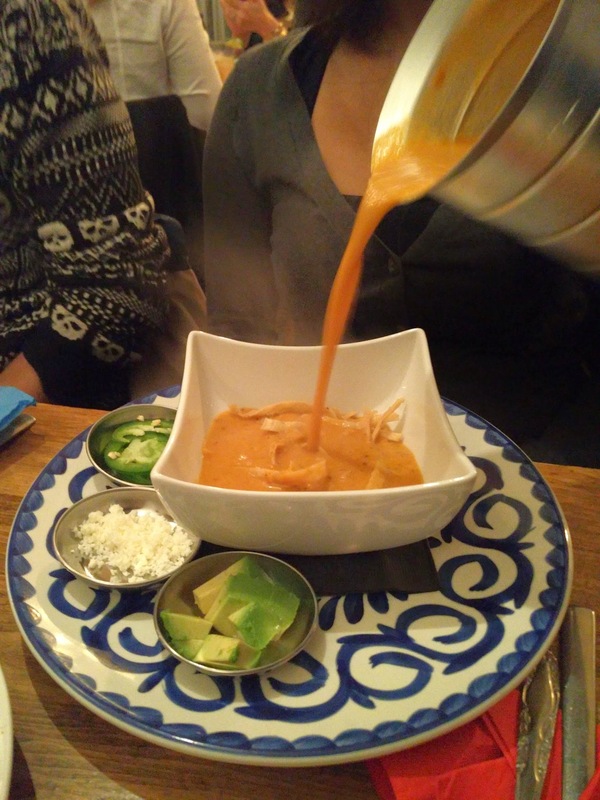 If there could be perfection captured in a bowl of comforting soup, it would be the Sopa de Tortilla, day or night. The Papas al Chipotle, coming to three hours of brewing, was unmistakeably rich in flavour with a resisting bite that was hard to share. 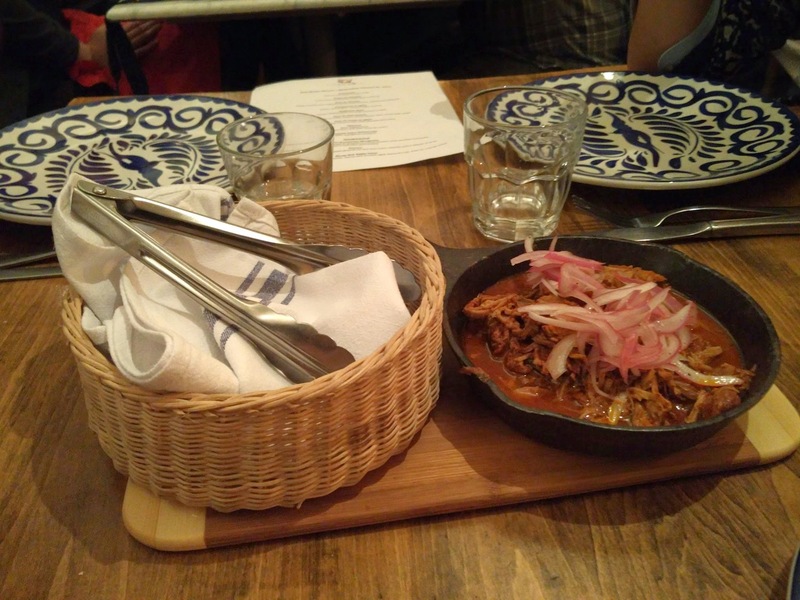 Next up is the Mayan shoulder braised pork, Cochinita Pibil – and boy do I love a good do-it-yourself touch. 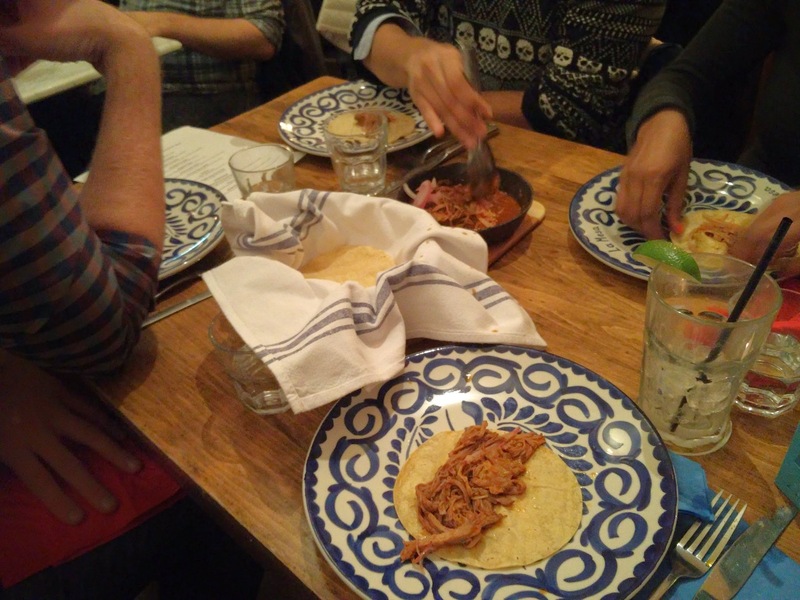 Steamy tortillas, braised pork to pinch and red onions for the topping – the juices created a sauce on it’s own. With a Paloma Cocktail to slurp for our next dishes onwards, it was a true Mexican classic of fresh squeezed grapefruit and lime juice, tequila with a splash of soda. 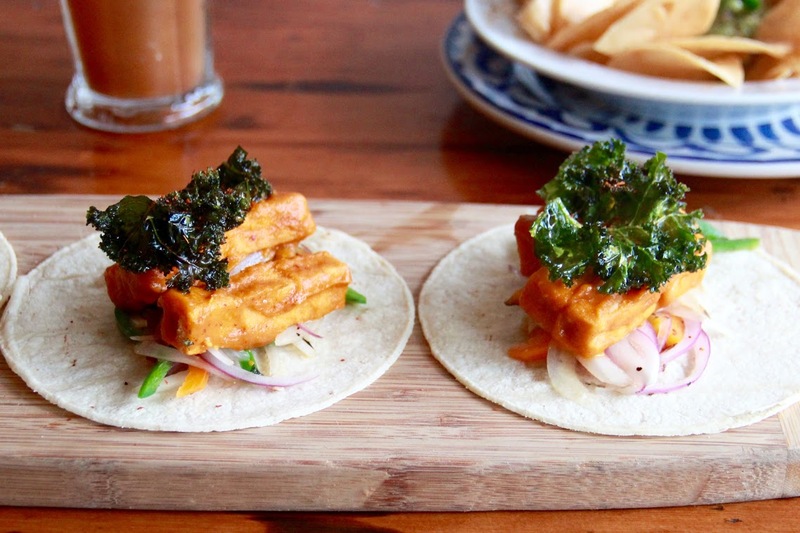 Meat-free tacos that are easy to boast is a rare commodity, Fonda Lola’s entrant this fall is the Taco de Tofu Sofrito, a delightful flavoured firm tofu strips cartwheeled in a smoky tomato and bell pepper sauce, topped with crispy kale chips. Shrimps are always a fun bite, for their fall menu, the Camarones al Ajillo is made of tiger shrimps that are tossed in sautéed garlic and guajillo on top of rice with a side of salad – the rice infused a rich sauce that made us go back for more scoops until the very last grain. 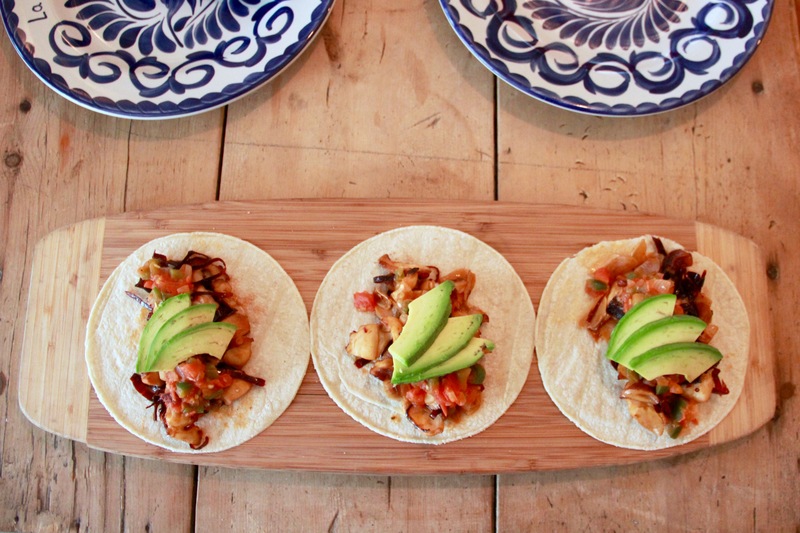 Of course, we had octopus on tacos, Taco de Pulpo al Ajillo – octopus is one of my favourite tacos to devour at a Mexican eatery as it is lovely to see what flavours shine through, this time around it shone, fresh, fresh, fresh! 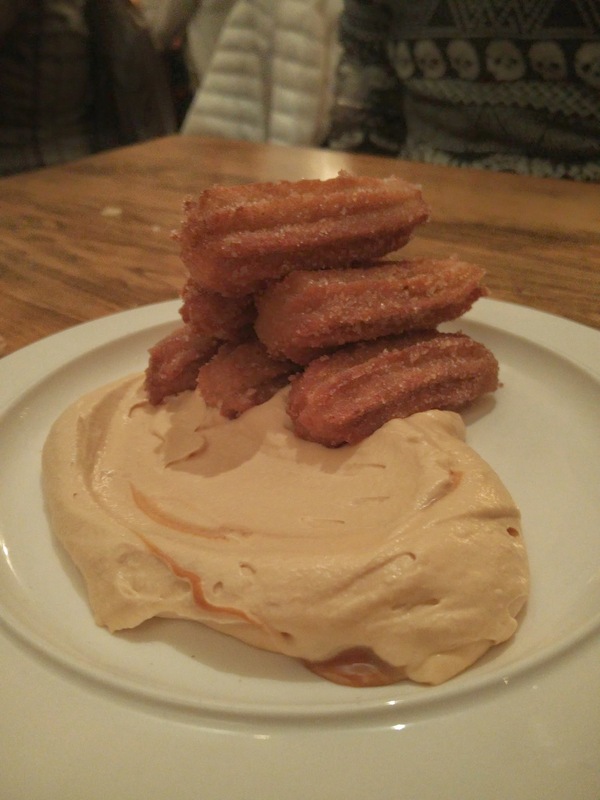 You’ve eaten churros, but you haven’t had the pleasure of indulging in Fonda Lola’s. 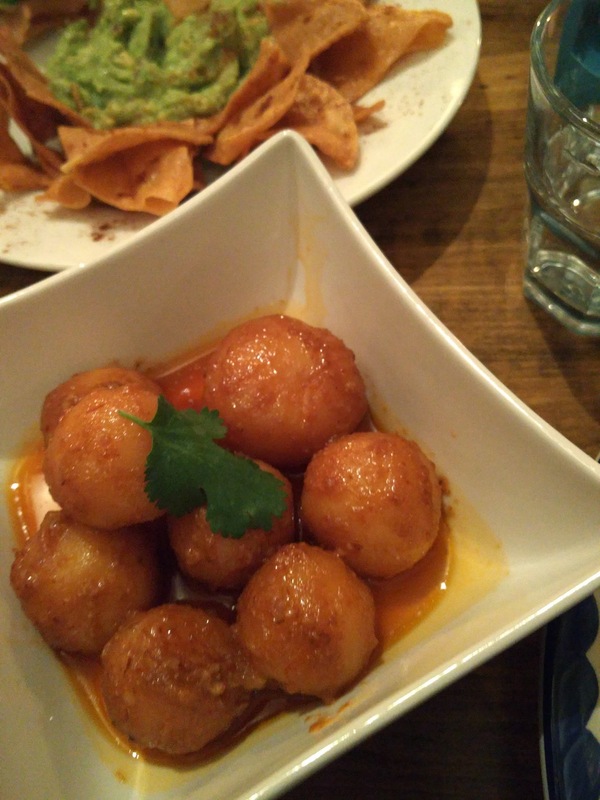 These deep-fried dough fritters are a wonder of it’s own: dusted in larger sugar particles, a higher quick-frying temperature for a super crunchy exterior and softer, delicate interior… then, going for gold dipping into a caramelized goat milk holding the perfect amount of sweetness. 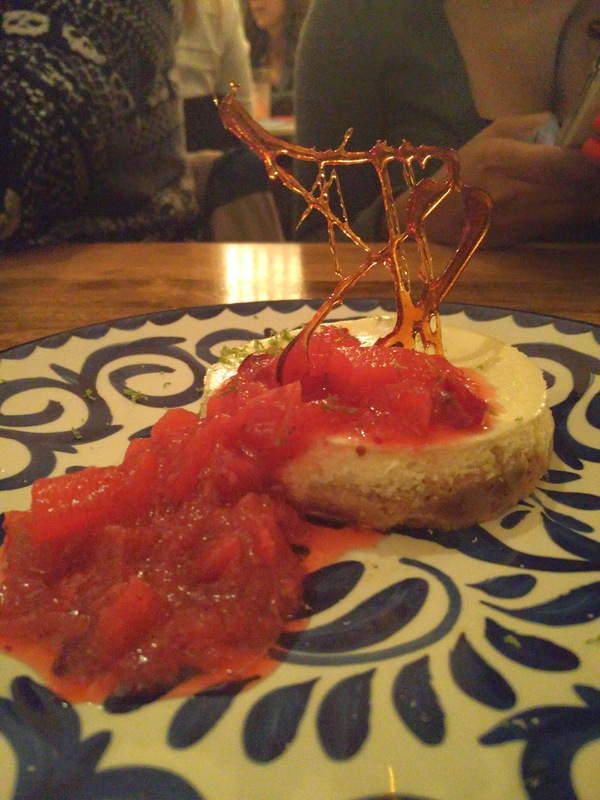 A am a big fan of any type of cheesecake, but Fonda Lola’s Tequila Lime Cheesecake was achieved with a Mexican twist, with of course, the use of tequila. The graham base was excellent to sweeten up the balance of the slightly tangy lime and margarita compote in the dish. Now running all of these sweet items down with Boozy Hot Apple Cider… the ultimate fall beverage. Imagine your ordinary Apple Cider, created, mojito-style. Strong and refreshing tinges of basil and mint purée, citrus, then spiked with housed aged Bacardi rum. We were absolutely satisfied with the authentic and exciting flavours – a true roller coaster of flavours with each dine. Make your way over to check their menu out here.